Benefits of Condominium Management in Sarasota - Advanced Management Inc. Which is better – self-managing a condominium association or hiring a professional condominium manager? This is a question that many associations face, and the answer isn’t always clear. While there are benefits on both sides, many have found that hiring a professional community manager is well worth the investment. Here are just a few of the benefits of hiring a professional company to take over condominium management in Sarasota and help you decide what’s best for your community. It only takes one troublesome tenant to end up involved in costly and time-consuming legal battles. Hiring reputable property management in Florida means having someone on your side who is familiar with the latest condominium laws and can protect you from lawsuits. A condominium manager will improve and prepare properties for rent, determine the best price and effectively market the property to fill vacancies as quickly as possible. Empty units don’t earn money for your association, so having someone who knows how to fill vacancies is vital. Working with a professional community manager ensures that there is a good tenant screening process in place. By properly screening potential community members, you can have reliable tenants that pay on time, stay longer, don’t damage the unit and generally cause less problems. Experienced managers have seen thousands of applications, and they know exactly what to watch out for. Keeping up with repair and maintenance keeps community members happy and preserves property value. When you hire a professional condominium management company, you’ll have access to their in-house maintenance staff as well as their network of reliable contractors and service providers. Because management companies are well known and provide contractors with a large amount of work, they’re usually able to secure better pricing than self-managed associations. Managing a condominium association is a lot of work, and it can be extremely stressful. Most condo owners have day jobs, and they’re only able to donate their time on evenings and weekends, making it difficult to take care of everything that needs done. In addition, when the Board is self-managed by members of the community, personal conflicts often arise, and trying to collect fees or enforce rules can be extremely difficult among friends. 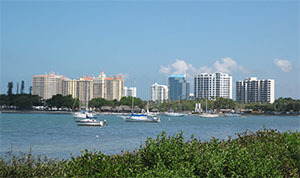 At AMI, we are proud to offer dependable condominium management in Sarasota . We have been managing condominium associations in the Sarasota area for years, and our community managers have the knowledge and experience to successfully manage communities of all sizes. They are passionate about their jobs, and they provide only the best service for condominium associations in Sarasota and the surrounding areas. To learn more about our services for condominium management in Sarasota , please contact us today!